"Those of you who live after me will see great disagreement. You must then follow my Sunna and that of the rightly guided caliphs. Hold to it and stick fast to it. Avoid novelties, for every novelty is an innovation, and every innovation is an error." The above hadith, attributed to the Prophet Muhammad by the authoritative Abi Dawood, is often cited as evidence of Islam's innate conservatism and antithetical relationship with innovation. According to Bernard Lewis, "the gravamen of a charge of [innovation] against a doctrine was not, primarily, that it was false but that it was new-a breach of custom and tradition, respect for which is reinforced by the belief in the finality and perfection of the Muslim revelation." As such, it is often assumed that Islam is fundamentally rigid and inflexible, more adept at waging wars against nonbelievers than at coming to terms with modernity. Islamic theology, philosophy, and jurisprudence, based on a worldview articulated some fourteen hundred years ago, and lacking an experience akin to the Christian Reformation, are stuck in eras long gone by. The underlying reason for this goes back to Islam's injunction against innovation, for innovation is to Islam, Lewis argues, what heresy is to Christianity. It cannot be denied that throughout Islamic history so far, "innovation" has been seen and treated as a slippery concept. The literal Arabic translation for "innovation" is bid'a, a concept that over time has come to acquire a highly negative connotation. After discussing the relationship between innovation and bid'a, and how the latter has come to acquire a negative, even dreaded connotation, this chapter will show, however, that innovation in Islam is neither new nor novel; nor, indeed, has it been that rare. Nevertheless, in the words of Michael Cook, for nearly a millennium a "conservative default" has characterized the Muslim world and the intellectual, artistic, economic, and scientific innovations produced within and under its umbrella. As with any other orthodoxy, discussions or manifestations of innovation are likely to provoke anger and rebuke when they are formulated and expressed within the context of Islamic orthodoxy. Naturally, reactions to innovation depend in large measure on exactly what is meant and understood by it, as well as the context within which this definition is produced and used. There is, nevertheless, more to the Muslim world's "conservative default" than the angry reactions of self-appointed bastions of traditionalism. Anti-innovationists operate within, and themselves are often products of, structural and environmental factors that shape and influence both their mind-sets and the mind-sets of their audience and their sympathizers. Why, then, the chapter asks, have the opponents of innovation found their message so resonant with the Muslim masses at large? The answer lies not so much in Islam itself or in anything intrinsically Islamic, but in the ways and means through which the teachings of Islam have been produced and perpetuated over time. As the chapters that follow show, in one form or another, innovation has historically been, and continues to be, present and persistent in Islam and the multiple facets of life that it engrosses. What have been absent, and ultimately what are urgently needed, are the institutions and the proper contexts that would facilitate its flowering. Bid'a is "a belief or a practice for which there is no precedent in the time of the Prophet." Though rarely mentioned in the Qur'an, the notion became prevalent soon after the death of the Prophet to refer to beliefs and practices that appeared to counter those endorsed by the Sunna and the Holy Book. In fact, beginning in the third century of Islam, an entire genre of bid'a literature emerged, which, despite a lull between the fourteenth and twentieth centuries C.E., has lasted up to the present day. On these grounds, there have been extreme cases in Islamic history when innovations as various as tables, sieves, coffee, tobacco, the printing press, artillery, the telephone, the telegraph, and, more recently, voting rights for women have been rejected as bid'a, contrary to the Sunna of the Prophet and his Companions. But inevitable changes in life and circumstances soon necessitated modification of strict interpretations of bid'a. Before long, distinctions began appearing between "good" or "praiseworthy" bid'as and those that were to be avoided at all times. Al-Shafii (b. 767 C.E. ), after whom the Shafii school of jurisprudence is named, was one of the earliest jurists who presented nuanced interpretations of bid'a, dividing it into five categories: (1) those bid'as that are necessary for and incumbent (fard kifaya) on the community, such as the study of grammar and rhetoric and investigations of the reliability of the men whose authority is cited for the Sunna; (2) forbidden (muharrama) bid'as, which run contrary to the Sunna and the consensus and accepted beliefs of the community (ijma); (3) recommended (manduba) bid'as, such as the establishment of hospices and schools; (4) bid'as that are disapproved but not prohibited (makruha), such as decorating mosques and copies of the Qur'an; and, (5) those that are permitted (mubaha) because the law is silent in their regard, such as wearing clothes and eating pleasant food and drinks. Despite the efforts of Al-Shafii and others to distinguish between varieties of bid'a, over time the concept has become generally understood to mean "any modification of accepted religious belief or practice." At the same time, more conservative Muslims have continued to label social practices of which they do not approve as bid'a. This absence of a universally agreed-upon definition of bid'a, as well as the inevitability of the need for adaptation to new and emerging circumstances, no matter how reluctantly, have combined to result in a number of consequences for innovation in Islam. Most notably, there have been instances and episodes of profoundly consequential bursts of innovation either by renowned Muslims or under the banner and rubric of the religion, or both. Due partly to the inevitability of changes in life and circumstances, partly to the dogged determination of individual innovators, and partly to the rare combination of a hospitable environment and supportive institutions, there have been instances of innovation in Islam that have even found sanction and support among influential jurists of the faith. What is thus important for us to consider is context-the context within which something is defined as bid'a, or, more accurately, disparaged, rather than being seen in a positive and welcoming light. There are countless examples that serve to illustrate the contextuality of bid'a at any given point in Islamic history. Here I shall briefly highlight two of the more interesting ones I have come across. In the early decades of the nineteenth century, when Sultan Mahmud II (r. 1808-1839 C.E.) was busy introducing modern reforms into the Ottoman state machinery and economy, a number of ulama (or mullahs) opposed the innovations on grounds that they both represented and facilitated bid'a. Some of these sentiments are reflected in an unattributed text from the time that denounces the evils of such modern innovations as steamships, factories, and the telegraph. In one of the passages, the text's anonymous author writes the following: "[Because of these innovations,] one's soul becomes insolent, because the soul is inclined to wicked deeds and most evil deeds are generally (committed) for money and valuables; and now if someone wishes to commit a deed in a far city, he can reach it quickly and do what he wishes." He further goes on to denounce these innovations on grounds that they make one's soul "conceited," reduce one's reliance on and trust in the Almighty, and cause one's recompense to be diminished "because one attains one's goal easily without effort." While it is difficult to determine exactly how representative of the opinions of the traditional clergy this text might have been, it clearly does appear to reflect an overall sentiment of unease and even anger and fear directed at what are perceived as prime examples of bid'a. Mahmud II's reforms represented more than mere jurisprudential infractions. They threatened the financial and institutional interests of the ulama in areas such as education and law, where they had long had monopolistic control. Furthermore, the sultan's founding of a Ministry of Awqaf (religious endowment) seriously undermined the ulama's financial independence. It is not unreasonable to conclude, therefore, that the charge of bid'a leveled against Mahmud II's reforms was motivated by concerns that were not based solely on religious considerations. At the same time, however, a number of the more senior ulama did not see the sultan's reforms in the same threatening light, or at least did not voice their opposition if they did, because of their proximity to the political establishment. Some, either out of prudence or out of conviction, even went so far as to join the ranks of the reformers. Depending on their positions, ulama variously saw the identical reforms as bid'a or not bid'a. A second, more pertinent example comes from the adhan (call to prayer) in Shi'ism. While performing this, Twelver Shi'as include Imam Ali in the wilaya (spiritual and temporal authority) by reciting the phrase "I bear witness that Ali is the friend of God" after the shahada (bearing witness to Allah and the prophecy of Muhammad). Although in the minds of most Shi'as, the wilaya has been a permanent feature of the adhan, the adhan in fact did not include the wilaya during the lifetimes of either the Prophet Muhammad or any of the Shi'a imams. Rather, the practice can be traced to the early sixteenth century. As part of a concerted effort by the Safavids to prop up a nascent state in Iran based on Shi'a identity, Shah Ismail (r. 1501-1524 C.E.) embarked on a determined campaign to encourage public expressions of Islam in a Shi'a form. One of his efforts to this end was to mandate that the wilaya be included in the adhan, a practice that had been seen as bid'a and thus prohibited, or at least discouraged, by earlier generations of Shi'a jurists. By the time of Shah Tahmasp (r. 1524-1576 C.E. ), the inclusion of the wilaya in the adhan formed only one part of a much larger menu of popular expressions of Shi'a religious identity that were meant to distinguish the Shi'ism of Iranians from the Sunni beliefs of Turks and Arabs. Other such identity-driven expressions included canonical cursing of the first three caliphs, visits to the shrines of imams or their descendants, and acts of self-mortification. Although they initially viewed most of these innovations as bid'a, many of the non-Iranian Shi'a jurists brought into the country to propagate the new faith had no choice but to accept and endorse them. Before long, what had once been bid'a had, at least for the Shi'a of Iran, become part of the Sunna. Both of the examples cited here point to the importance of the political context in shaping perceptions of an innovation as either acceptable or bid'a. But social, cultural, and economic contexts can be just as important in determining the fate of an innovation. Upon its introduction into the Cairo market by an especially enterprising merchant between 1580 and 1625, for example, drinking coffee-or "black water"-was seen as tantamount to bid'a and was therefore vehemently denounced by the ulama, who urged the faithful to attack and destroy coffeehouses. "A half-millennium later, leaders of Saudi Arabia's puritanical Wahhabi sect proudly serve coffee to their guests, treating it as an ancient Arab delicacy, usually without an awareness of the history of the Arab and Islamic resistance to this custom." The Saudi ulama's initial resistance to television in the early 1960s, on grounds that it contravened Islam's ban on graven images and encouraged idolatry, soon gave way to its endorsement. Once they learned of television's "immense potential as an instrument of religious indoctrination, they promptly discovered that it falls, after all, within the sunna," Timur Kuran notes. "[N]umerous other innovations have gained Islamic legitimacy following a period of fervent resistance." Often, jurists themselves, keenly aware of life's need for innovative change and adaptability, found ways around the prohibition of bid'a by manipulating the term. Such a manipulation, Vardit Rispler contends, "constructed another evaluative system outside of the Shari'a [Islamic law] which shares its terminology and general values but tackles phenomena not dealt with by the Shari'a." By doing so, they would change the context within which bid'a was received and perceived. Perhaps more than any other factor, context determines whether an innovation indeed amounts to bid'a or is in accordance with the Sunna. Notwithstanding occasional bursts of innovation, the larger Islamic milieu has not on the whole been conducive to sustained innovative thoughts and ideas, practices, and institutions. Jonathan Berkey has argued that a "principled aversion to any innovation remained an important, if not universal, element in medieval Islamic discourse." We see the same phenomenon, in one form or another, present at various other eras of Islamic history. An overarching conservative inertia overcame the Muslim world beginning in the tenth century C.E. A key aspect of Islam stricken by this inertia was ijtihad, independent reasoning, as opposed to taqlid, or accepting the opinions of the founders of madhabs (schools of jurisprudential thought). Beginning in the tenth century and lasting into the eighteenth and nineteenth centuries, a consensus emerged that ijtihad was forbidden and that taqlid was incumbent on all Muslims, both laymen and scholars. There were, to be certain, notable and highly consequential exceptions, among the most significant of which were the intellectual contributions of the likes of Ibn Sina (980-1037 C.E.) and Ibn Rushd (1126-1198 C.E. )-known in the West as Avicenna and Averroës respectively-both of whom shaped and influenced much of what we know today about science and philosophy. Over the next few centuries, spectacular architectural glory was also achieved in such Muslim cities as Isfahan, Agra, and Istanbul. But gone are the days when Islamic intellectual achievements-in mathematics and astronomy, artillery and industry, medicine, philosophy, and physics-paved the way and helped inform Europe's scientific revolution. Islam's own internal scientific revolution was aborted, its spirit of discovery dampened, its contribution to world civilization now much smaller than that of Europe. What transpired to make Islam a bastion of conservatism? What was it that robbed it of its spirit of discovery and innovation? Why is it that Islam's most notable intellectually innovative movement of modern times-Wahhabism-calls for an aggressive regression into traditions, with its genesis not in Cairo, Isfahan, or Istanbul, once renowned for their intellectual vibrancy, but in the barren deserts of Arabia's backlands? The absence of spirit of innovation in Islam from about the tenth to the nineteenth centuries can be attributed to four interrelated and mutually reinforcing factors. Perhaps the most important of these has been what one scholar has called "Islam's self-image of timeless perfection." With the Qur'an held to embody "the unaltered words of God," Islam is thought by the believers to outline the perfect way of life, which cannot possibly be improved upon. "In an already flawless social order, innovation cannot yield benefits and may well do harm." Even to this day, there are articulate voices calling for the preservation of Islam's perfection and purity. "The protected knowledge of Islam is timeless and imperishable," writes one such voice. "It is handed down from one generation of Muslims to the next without innovations, alterations, or diminishment in value. Each generation uses this knowledge to protect and nurture a morally intelligent life." One important consequence of this denial of legitimacy to innovation is "institutional fixity." Islam, it is assumed, created the perfect social order, and along with it established all the institutions that society needs. If institutions are to change, the drag pulling them back makes the change halting and highly incremental at best, negligible or imperceptible at worst. The institutional context within which Islam has found itself, or, more accurately, its lack thereof, has been a second important factor contributing to the Muslim world's "conservative default." On both the individual and collective levels, innovation depends on institutions. But the early institutions that were established, whether through religious or temporal authority, or both, became frozen in time and did not change with evolving needs and circumstances. In the economic domain, for example, by the time the fifteenth and sixteenth centuries arrived, the economic and financial institutions found in the Muslim world remained woefully inadequate to address the increasing volumes of trade with and competition from Europe. Whereas European economies rapidly developed institutions designed to facilitate their expansion in both depth and scope, much of the Muslim world lacked such basic economic instruments as impersonal contracts and financial exchange mechanisms, corporations, and record keeping. As Timur Kuran explains, "No matter how motivated people are to experiment, take chances, or explore the unknown, if they cannot raise the necessary capital, or entrepreneurial rewards are vulnerable to predation, they will turn their energies elsewhere. To an outsider they will seem fatalistic or wedded to tradition. They will appear to lack the motivation to improve the workings of their society, solve problems, and raise living standards." Also consequential has been the absence of a mechanism in Islam whereby bodies of jurisprudential, theological, and philosophical knowledge can each be systematically collected, compiled, and, most important, built upon. Islam lacks a corporate body of jurist doctors, a church, either by whom or against whom cohesive bodies of religious doctrines could be collected and compiled over time. Islamic law saw its most remarkable growth in the first two hundred and fifty years of its existence, for example, driven by an ijtihad that was "open, bold, intellectually charged, and controversial." But the subsequent closure of the "gates of ijtihad" by both bid'a-weary ulama and temporal authorities did much to abort what could have been a sustained expansion in Islamic legal thought and framework. Against a backdrop of Islam as the provider of the perfect social order, when it came to legal and jurisprudential issues, "neither innovative religious opinions nor the creative judgments of Islamic courts were treated as legal advances of broader relevance." There were no legal precedents for judges to refer to, and they had instead to go back to the original sources to arrive at their opinions. The potential for evolution of Islamic legal and jurisprudential thought was undermined in the process. A similar development characterized the practices of ijtihad and tafsir as well. Seldom were the conclusions and inferences derived from ijtihad and tafsir used as basis for further developing a progressively evolving doctrine or body of thought that built on previously acquired knowledge. Thus even like-minded jurists and ulama often operated in intellectual wildernesses, absent any nexus of solid, deeply rooted intellectual lineages. A "collective memory" of the innovativeness of the past and the dynamism of Islamic history never emerged. Again, the prevailing "conservative default" served as an overarching backdrop against which innovative ijtihad in particular had to reinvent itself again and again, leading to dramatic reversals in the direction of thought from one time to another. The intellectual genealogy and subsequent career of Rashid Rida (1865-1935) best illustrates this point. Rida considered himself a great admirer and, perhaps undeservedly, the intellectual heir of the contemporary renowned reformist thinkers and activists Jamal al-Din Afhagni and Muhammad Abduh. Both Afghani and Abduh sought to modernize and reform Islam by resurrecting its original spirit of ijtihad, scientific exegesis, rationality, and interpretation. But Rida was more interested in Islamizing modernity than in modernizing Islam. His approach to the Holy Book became increasingly literalist; he saw the West increasingly as a source of threat rather than scientific and technological inspiration, began advocating Shari'a as a suitable substitute for imported Western law, and preferred the caliphate to parliament. In the end, the efforts of Rida and others like him turned the ostensibly progressive Salafism of Afghani and Abduh into "a backward-looking ideology ill-prepared to confront the challenges of the modern world." Finally, stagnation and lack of innovativeness tend to be self-perpetuating. Innovation often creates disjunctures and opportunities for further innovation, whereas its absence makes society accustomed to inertness and stasis. A slow-changing society often develops an impulse to conserve and preserve its own and its surrounding environment. Conservative traditionalism can serve as a blanket stifling other potential sparks of innovation. As Kuran argues, "a society can stagnate because it was stagnant in the past. It can find itself trapped in a lethargic state characterized by low entrepreneurship, not because it lacks risk takers capable of innovation but simply because of its entrepreneurial history." Together, these four factors-Islam's self-image of timeless perfection, the institutional context in which knowledge of Islam has been acquired and passed down, the absence of mechanisms for the accumulation of a collective memory of the dynamism and inventiveness of Islam, and the self-perpetuating nature of stagnation-have combined to reify popular and scholarly perceptions of bid'a as illegitimate tinkering with the Divine Will. Today bid'a is still seen as blasphemy, and the label is used, albeit seldom, against innovators perceived to be corrupting the purity and essence of the religion. Needless to say, life in the normal sense as we know it today would not be possible, or at least would be exceptionally difficult, without some innovation. As J. Robson comments, "Only people of an ultra-conservative nature who live in an unreal world of their own ideas could insist that the practice of the Prophet and his Companions in al-Madīna may alone be followed, and that no allowance may be made for the development of knowledge and differing circumstances." Nevertheless, in an age when Islamic fundamentalism has, rightly or wrongly, become the public face of Islam for much of the world, and when the Muslim world is replete with dictatorships fearful of even innocuous smatterings of innovation, those advocating innovation in Islam face an uphill battle. The times and the circumstances may have changed, but the outlines of the arguments for and against innovation, and the threat of being accused of bid'a, have stayed the same. None of this has succeeded in extinguishing the spirit of innovation in Islam altogether. As the present book attests, despite all the strikes against it, innovation has managed to find its way into Islamic literature and poetry, hermeneutics and knowledge accumulation, patterns of political rule and minority relations, perceptions of the modern world, and even the adhan and ijtihad. Collectively, the chapters argue that not every innovation has been seen as an error. Some innovations, in fact-indeed, many innovations-are perfectly compatible with and completely acceptable to Islam. In working on the various chapters that comprise this book, the contributors were given a simple mandate. They were asked to highlight those innovative approaches, within the broader context of Islam, that have occurred in their areas of study and specialization. In a few instances, as the reader will quickly discover, the authors themselves make suggestions as to the changes needed to the context, perceptions, and hermeneutics of Islam-not to the sacred religion itself-that will enhance its resonance and its concordance with the modern world in which we live. The overriding objective here has been to demonstrate that Islam as both a worldview and as a comprehensive system of social and political organization is fundamentally adaptable, and therefore fundamentally applicable and relevant to today's modern world. As the authors here demonstrate, it is not Islam per se that needs to change in order for it to once again become a leading source of-or at least context for-innovative change and progress in fields such as scientific and intellectual production and social and political organization. There is nothing about Islam that is inherently inimical to adaptability and the essence of innovation. It is not in Islam itself that we must seek the answer to Bernard Lewis's rhetorical question "What went wrong?" Instead, as argued above, the answer lies in the larger context within which Islam has historically found itself, in the ways in which knowledge about Islam has been acquired, accepted, and internalized, in perceptions about Islam that have developed and have become ingrained among both believers as well as non-Muslims, and in the reactive postures thus assumed worldwide in relation to Islam. 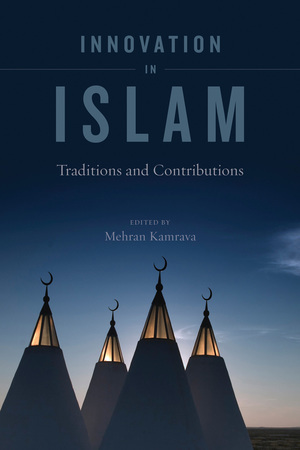 The chapters here, written by some of the contemporary pioneers of innovative thought and historiography in Islam, look at innovative approaches adopted by Muslims and in Muslim-majority societies in relation to literature and the visual arts, intellectual thought, debates and discourses revolving around gender issues, and Islam and perceptions of it in the modern world. Accordingly, the book is divided into three parts. Part I looks at the question of how knowledge of Islam is produced, accumulated, and given shape and direction, and what the current and future directions of Islamic thought, among both Sunni and Shi'a thinkers, are likely to be. In short, Part I examines the intellectual processes involved in formulating knowledge of Islam and moving it forward. Tariq Ramadan's work leads the cluster of chapters in the first section of the book and offers a critical examination of the ways in which Islamic knowledge and hermeneutics are accumulated today. Ramadan also looks at those aspects of the religion's understanding and practice where reforms are needed, focusing specifically on the ways in which knowledge about and within Islam has been produced, accumulated, and transmitted. Ramadan rejects the proposition that the Qur'an itself needs to be reformed, a proposition that, he claims, is becoming increasingly prevalent among certain academic circles in the West. Instead, he maintains, it is the hermeneutics of Islam and, more specifically, the historical operationalization of certain key concepts-especially tajdid and islah, renewal and reform, and ath-thabit and al-mutaghayyir, the immutable and the changing-that need to be rethought and reformulated. "A dialogue has begun," Ramadan has written elsewhere. "An intense, constantly renewed dialogue between a Book that speaks the infinite simplicity of the adoration of the One, and the heart that makes the intense effort necessary to liberate itself, to meet him. At the heart of every heart's striving lies the Koran. It holds out peace and initiates liberty." What is needed, Ramadan argues, is a changed ijtihad, a "critical reading of texts," under what Ramadan terms "very precise conditions." Mohammed Arkoun's "Deconstructing Epistēmē(s)" takes these arguments one step further. Historically, Arkoun maintains, scholars have focused on the intellectual processes involved in the historical development of "Islam." With an intellectual career spanning decades, and a highly interconnected body of works and theoretical contributions that have yet to be systematized, Arkoun's contribution here goes to the heart of his larger project of developing a critique of Islamic reason. We need to understand "Islam" as the intellectual productions of Islamic thought, he argues. Western scholarship on Islam has considered the history of Islamic thought in the cognitive frame of a linear history of ideas and schools of thinking in each discipline, focusing mainly on the major texts of the formative and classical periods. Despite sporadic scholastic reproduction, collection, and summaries by Muslim scholars over the past few centuries, in more recent times, up until the introduction of fragments of European modernity, Islam experienced what Arkoun calls "intellectual shrinking and epistemic regression." To rectify this, Arkoun elaborates on the concept of historical epistemology and applies it to Islam's "closed official corpora." An avid defender of postmodernist thought, Arkoun seeks first to deconstruct what he perceives as an ossified discourse of Islam and then to reconstruct a new one in its place. He has long decried "one-dimensional" approaches that "have exercised little or no intellectual caution in overgeneralization of the data concerning Islam." Thus he sets out here-and elsewhere in his writings-to deconstruct and to open up the epistemic accumulation of knowledge on Islam. He does so by surveying four different discourses within Islam-the Qur'anic discourse, the hadith and sira (biographies of the Prophet Muhammad) discourse, the Shari'a-fiqh discourse, and the historiography discourse. Arkoun maintains that each of these discourses has a different linguistic and semiotic status, and must therefore be considered in its own historical epistemic environment without mixing any level of analysis with the traditional normative theological and exegetical approaches. Arkoun limits his inquiry to two basic epistemic systems: the deconstruction of the Mushaf and its epistemic environment, and the deconstruction of the foundational system of thought ('ilm usul al-din and usul al-fiqh). This, he believes, goes some ways toward a "radical revision of the concept of religion," eventually ending the erosion of its central message and making obsolete its polarization. Ramadan and Arkoun, as well as Abu-Zayd and Mir-Hosseini in later chapters, call not so much for innovation within Islam as for innovative approaches to understanding Islam and its precepts. In chapter 4, I focus more specifically on the innovations that are currently taking place within Iranian Shi'a doctrine and jurisprudence. I chronicle the direction of Iranian Shi'ism after the country's 1978-79 revolution and the debates within it that have come to constitute what I label a "reformist religious discourse." Some of the most fundamental principles of Shi'a fiqh and theology have come into question as a result of this emerging discourse, I argue, the long-term consequences of which are bound to influence the overall nature and direction of Shi'ism in the future despite political impulses emanating from the state to the contrary. I am reluctant to go so far as to maintain that the reformist religious discourse has sparked a religious "reformation" in Iran. But, I argue, it has indeed started a process that, if given the right type of institutional support, could result in a fundamental reformation of Iranian Shi'ism. Part II concerns innovation in the literary and visual arts of Islam, beginning with Nelly Hanna's examination of Yusuf al-Maghribi's Raf' al Isar fi kalam ahl Misr, a seventeenth-century dictionary of the colloquial Arabic of Cairo, which is innovative because the author is more concerned with practice and words as they were used, rather than with the correct, or strict, dictionary meaning. He distinguishes between the ways in which a word was used by different sectors of the population. Hanna approaches al-Maghribi's work in terms of the social, political, and cultural contexts of its time rather than in terms of the history of its genre. Thus it can be studied as a source for social history, or as a "dictionary from below," in the sense that the author includes the vocabulary used by women, by children, and by craftsmen. He also includes autobiographical information that sheds light on his life and his family. Hanna concludes that this approach to al-Maghribi's dictionary allows us to see links between the cultural history of the seventeenth and the nineteenth centuries. Nasr Abu-Zayd tackles the question of translation of the Qur'an and the daily prayer, salat. This is a topic to which he has paid considerable scholarly attention over the years, and one that has caused him much discomfort and controversy. In his contribution here, Abu-Zayd poses a simple but central question: is the prayer understood to be the word of God itself, or is it meant to represent the meaning of God's word? Put differently, can the Qur'an be read and understood in languages other than Arabic, especially in the today's world, when a majority of Muslims around the globe happen to be non-Arabs? He explores this question from the three perspectives of theology, jurisprudence, and literary criticism, delving into the classic debate of whether the Qur'an is divinely created or man-made. Language, he maintains, is central to any understanding of religion-and especially of man's relationship to the Creator-and in ways that professions of faith are expressed. Ultimately, Abu-Zayd seems to reach ambiguous conclusions. For ritualistic purposes, he maintains, translation of the Holy Book cannot be allowed, but for learning and exploration, one can indeed resort to translation and interpretation. Innovate, but not too radically, seems to be the implied message. Adonis and Laude turn their attention to poetry. Through examining the broader relationship between poetry and innovation in Islam, Adonis, one of the Muslim world's most celebrated contemporary poets, offers a frontal secularist assault on ossified conceptions of Islam. As the embodiment of perfection, he argues, Islam saw no need for literary and poetic innovation, instead associating poets with the supernatural jinn. "In Muslim religious life," he laments, "copying and imitation triumph over criticism and renewal." Islam today has become more of a "closed and ritualistic political system" rather than "one of learning and spirituality." What Islam lacks sorely, and what it needs urgently, is "renewal." Perhaps not coincidentally, Adonis prefers to use "renewal" (tajaddud) rather than "innovation" (ibda'). But, he concludes, there is a "deep theoretical revolution" inherent in Islam, which today has been hijacked by the forces of fundamentalism. Reclaiming the true essence of the religion, he argues, cannot take place in isolation from freedom, both of thought and action. Patrick Laude focuses more specifically on Sufi poetry. In "Creation, Originality, and Innovation in Sufi Poetry," he explores the spiritual function of poetry in Sufism as a paradoxical, ever-shifting mediation between presence and absence. Beginning with a consideration of the Qur'anic understanding of poetry as a problematic human activity that may give rise to pretension and hypocrisy, he proceeds to define the requirements of what he considers to be "an authentically Islamic" poetry. Maintaining that Sufi poetry is in fact the epitome of Islamic poetry throughits "cultivation of inner authenticity," Laude argues that poetic inspiration amounts to an originality flowing from the very source of the spiritual tradition. Walter Denny focuses on innovation in Islamic visual arts. The commonly held vision of the visual arts holds that artistic innovation and artistic creation are virtually synonymous. The art of Islamic cultures, in common with all visual art traditions, also draws its distinctiveness in style, subject matter, genre, and aesthetics from its continuity with tradition. According to Denny, innovation within tradition has thus been encouraged, respected, admired, and emulated from the first centuries of Islam, when a distinctive Islamic style emerged in art and architecture, down to the present day, where we see new directions in contemporary visual arts from the Maghreb to Indonesia. What makes innovation in the Islamic artistic traditions distinctive, Denny argues, is the peculiar nature of interplay between innovation and tradition in different places and epochs. To examine how this interplay affects the creative process, Denny examines a number of specific cases: Islamic ceramics and the relationship between technical and artistic innovation; Islamic architecture and the relationship between engineering and spatial innovation; and the art of the Islamic carpet, deeply embedded in all social and economic levels of certain Islamic cultures, and often stereotyped as the most traditional of Islamic art forms. Part III expands on the context and institutions through which innovation in Islam has been made possible, and the reactions to and consequences of the interplay between and Islam and the modern world. Regardless of what discourse and reality might be, perceptions of reality or discourses surrounding it are often something quite different. Perceptions of Islam, its role and place in modernity, and particularly its relationship with the generic "West" have been especially problematic in the post-9/11 world. Sherman Jackson draws our attention to the contemporary era and to realities as they currently affect Islam and Muslims in the West in general and in the United States in particular. In "Liberal/Progressive, Modern, and Modernized Islam: Muslim Americans and the American State," he looks at some of the most pressing issues related to perceptions, identity, and the self that Muslims in America face today. According to Jackson, even in the most learned circles of non-Muslim scholars and observers of Islam in the West, the notion that Muslims can fully indigenize their religion without compromising its fundamental constitution is challenged, if not rejected outright. This presumes, of course, that the West itself is an uncontested category to which Muslims, as newcomers, must simply accommodate themselves. It also assumes that liberalism is the only legitimate discourse in which such a conversation can proceed. Moreover, it also assumes that Muslims in the West are devoid of agency, and that "Islam" itself is a wholly fixed and unresponsive monad. There is, Jackson argues, the ever-present danger that "predatory reason and rationality" will continue to perpetuate the gap between Muslims and non-Muslims in America. But both Islam as a religion, on the one hand, and American identity, on the other-or any other identity for that matter-are both heterogeneous and dynamic, and, in Jackson's view, adaptable and accommodating. Many of the habits, customs, and legal institutions attributed to Islam have been products of existing circumstances and predicaments rather than anything innately "Islamic." As such, there is nothing inherently contradictory between Islam and America, including especially American democracy and identity. Questions of identity, symbolism, and theological justifications and discourses are further explored in chapter 11, in which Ziba Mir-Hosseini draws our attention to the issue of hijab-the covering of a Muslim woman's body-and the politics and theology of this most visible Islamic mandate in Islamic fiqh (jurisprudence). For more than a century, Mir-Hosseini claims, hijab has been a major site of ideological struggle between traditionalism and modernity, and a yardstick for measuring the emancipation or repression of Muslim women. In recent decades hijab has become an arena where Islamist and secular feminist rhetorics have clashed. For Islamists, hijab represents their distinct identity and their claim to religious authenticity: it is a divine mandate that protects women and defines their place in society. For secular feminists, hijab represents women's oppression: it is a patriarchal mandate that denies women the right to control their bodies and to choose what to wear. The clash has been particularly strident in Iran, according to Mir-Hosseini, where the state has twice intervened with legislation to an extent that no other Muslim country has experienced. Iran has also been a prime site for the emergence of "Islamic feminist" discourses that speak of hijab not as a "duty," but as a "right," and as a social rather than a religious mandate, and find juristic arguments to support this position. Mir-Hosseini-who herself is part of the generation of reformist Muslim intellectuals in Iran whom I discuss in chapter 4-traces the genealogy of this new juristic position from classical fiqh's notions of hijab. She documents how jurisprudential positions and notions of hijab in Iran have evolved in response to sociopolitical factors. Her chapter concludes by highlighting wider implications of the new juristic position on hijab for establishing common ground between secular feminist and Islamic discourses. In the book's final chapter, John Voll examines a different type of innovation in Islam, namely, that represented social movements. According to Voll, the broader patterns of the development of these movements reflect the dynamism of the interactions between Islam and modernity. It is important, he argues, to look at the broader historical dynamics of these developments as well as to examine the specific movements within their own unique contexts. Over the past two centuries, according to Voll, a wide range of innovative adaptations have taken place in the nature of both Islamic movements and also in modernity itself. Voll's chapter reminds us once again of the importance of context for the extent to which adaptability and innovation may permeate Islam at a given time or place or, alternatively, may be divorced and distanced from it. The burdens accumulated by the hermeneutics and epistēmē of Islam over the course of their intellectual journey across the centuries have frequently overwhelmed and overshadowed its spirit of innovation and adaptability. As the works here and elsewhere by Ramadan, Arkoun, Abu-Zayd, and Mir-Hosseini demonstrate, there has also been a rich tradition within Islamic thought, both contemporary and classic, determined to rid Islamic hermeneutics of its historical barnacles and to free up its spirit of adaptability and innovation again. That innovative writers, thinkers, biographers, poets, and artists belonging to Muslim traditions have seldom met a receptive audience in their own surroundings, and that intellectuals and laypersons belonging to "the other," the West, have seemed reluctant to acknowledge and nurture the innovative stream within Islam, has made innovation in Islam appear even less of a reality, or possibility, than it really is. Collectively, the chapters in this book give us insights into the complexity of the issues surrounding the notion and manifestations of innovation in Islam. As is amply evident in the following pages, "innovation" and all that it implies remain deeply contested in Islam in the fields of literature and the arts, hermeneutics and epistēmē, gender and race relations and representations, perceptions of "the other," and Islam's place in the modern world. What follows are far from definitive answers to questions that have long preoccupied observers and believers alike insofar as change and innovation within Islam are concerned. But this is nevertheless an important start to, or, more accurately, another effort to restart, the process of rethinking some of the propositions and perceptions that have come to characterize views of and views within Islam. For now, the contest continues. Why has the West developed and modernized, while the Muslim world has lagged behind? Why has democracy not found a hospitable home in much of the Muslim world? Why have the opponents of innovation found their message so resonant with ordinary Muslims? Featuring essays by a multidisciplinary group of leading scholars, this volume offers in-depth analyses of the history, causes, consequences, and obstacles to innovation in Islam. Focusing on the ways and means through which the teachings of Islam have been produced and perpetuated over time, the contributors investigate such areas as the arts and letters, jurisprudence, personal status, hermeneutics and epistemology, and Muslims’ perceptions of the self in the modern world. Innovation in Islam illuminates a debate that extends beyond semantics into everyday politics and society—and one that has ramifications around the world. Mehran Kamrava is Interim Dean of Georgetown University’s School of Foreign Service in Qatar and also the Director of the School’s Center for International and Regional Studies. He is the author of The Modern Middle East: A Political History since the First World War (second edition, UC Press) and Iran’s Intellectual Revolution. He has also edited The New Voices of Islam: Rethinking Politics and Modernity (UC Press). "The economic and political underdevelopment of the Islamic world is commonly attributed to conservatism rooted in Islam. This splendid collection of provocative essays addresses the issue from several different perspectives and in various contexts. Collectively, the essays provide a broad introduction to the topic of innovation in Islam, both through what they teach and what they invite the reader to pursue." 2. Knowledge and Hermeneutics in Islam Today: Which Reform?